Everywhere I look these days, I see tearooms and gourmet teashops springing up! Now that people realize that tea is both tasty and healthy, drinking tea seems to be the trendy thing to do. Even coffee shops like Starbucks are adding more tea to their menus to cash in on the trend. What is the appeal of tea? Have you ever noticed that when you drink a cup of tea, you don’t get that instant jolt of energy that you get from coffee? Instead you get a less intense, but more sustained rise in energy that continues long after coffee’s caffeine has worn off. As an additional benefit, instead of making you jittery after a few cups like coffee can, tea actually seems to calm your nerves. Before we go any further, when I talk about tea I’m always talking about the true teas (black, green, white, pu-erh or oolong), which all come from the Camellia sinensis plant. All true teas have caffeine in them, but to varying degrees. I’m not talking about tisanes, which are also called herbal teas and rarely have any caffeine at all. Why does tea affect us differently than coffee? Tea tends to have less caffeine then coffee: A cup of brewed tea has about 40 milligrams of caffeine on average, which is less than half that contained in a cup of coffee. Of course, the exact amount of caffeine depends on the type of tea and how long it has been steeped. For example, green teas tend to have less caffeine than black teas and a tea steeped for 5 minutes will have more caffeine than one steeped for 2. Tea is rich in polyphenols: Polyphenols are antioxidants that not only help to neutralize cell damaging free radicals, but may also help to slow the absorption of caffeine into the body. That could be why the caffeine from a cup of tea doesn’t hit you as hard or as fast as the caffeine you get from a cup of coffee. Instead, you get a less intense, but more sustained energy. Cardiovascular health: Tea has been shown to reduce the risk of heart disease, stroke, blood pressure and lower total and LDL cholesterol (the bad cholesterol). Cancer: Some studies have shown that tea may have anti-tumor properties and may play a role in reducing the risk of cancers. More studies need to be done though in order to confirm that link. Other: Some studies are showing that tea may also contribute to oral, bone and immune health. There is also some speculation that green tea may aid in weight loss and control or prevent Type 2 diabetes. Even though more studies are needed to confirm the effect that tea has on specific health issues, most experts do agree that tea is a very healthy beverage that has a lot to offer your body and should be consumed. So, the next time you are feeling stressed and tired and want something to both relax you and perk you up, go for a cup of tea instead of a cup of coffee or soda. 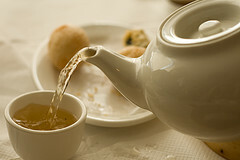 Tea is not only very healthy, but it will also help to relax you and give you the sustained energy to finish your day! I find myself drinking more and more tea, and less and less coffee, lately. Nice to know it’s good for me. Do you buy your tea online? I’m not finding good teas in stores in my area. Only at the big grocery stores and they seem to carry only the commercial boxes. I would drink more tea if I could find more interesting types. My favorite is lapsang souchong but can’t find it anywhere. I’d like to try the silver needles you have mentioned. @Andrea Yes, I buy most of my teas online. I mainly drink organic loose leaf teas and I buy them at various places online. You can definitely find more selection on the Internet. Just do a search for the specific tea you like. Yay for tea! I tossed my coffee addiction several months ago and find that if i have a cup now days I feel like I’m on crack! Not that i would know. Especially over here in Australia…the coffee is a lot stronger. My faves at the moment are roobis vanilla, and lemon grass ginger. A perfect accompaniment to working at home. Thanks for the great facts Talli. I love drinking my green tea daily. Coffee has been out of my life for some years.Good podcast.